Large-Leaf Pondweed has long, wide leaves that curl away from the stem. 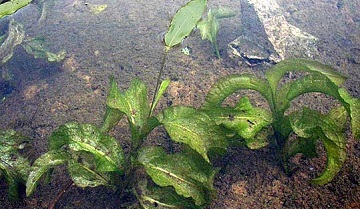 The Large-Leaf Pondweed is known for having the widest leaf amongst submerged plants. These large leaves are slightly folded, and curl backwards away from the stem. They can green or brownish in color and a little bit transparent. This plant is similar to the Illinois pondweed, but it has more leaves with more veins (27-35 veins per leaf). A thick stem of nutlets is located at the top of the plant. Typically found in the northern half of the United States. Because of mineral deposits in the hard water in the northern half of the U.S. Leaves may appear brown in color. Spritflo herbicide can be used to combat large-leaf Pondweed. Alternative treatment products include Aquathol, Aquathol K liquid, Dibrox and Sonar A.S.
You can order these products on this website.